SC12F Features: -Comes with a single door. -Meets NFPA Code 30 and OSHA Standard 1910.106 for Class I,II,III. -Capacity: 12 Gallons. -Welded steel construction. 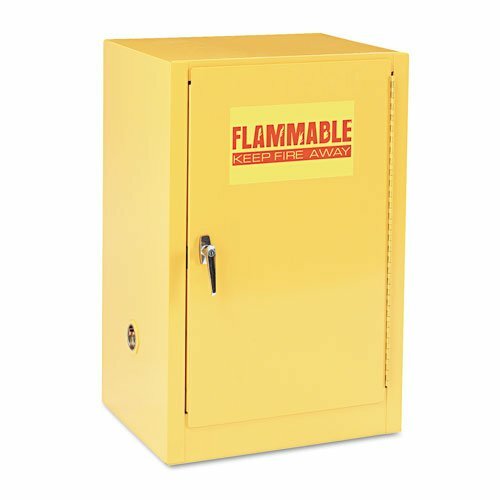 Product Type: -Safety cabinet. Locking: -Yes. Mount Type: -Freestanding. Finish: -Yellow. Number of Items Included: -6. Primary Material: -Metal. Shelves Included: -Yes. Adjustable Shelves: -Yes. Dimensions: -One 500 capacity galvanized shelf adjustable on 2.5'' centers. Overall Height - Top to Bottom: -35". Overall Width - Side to Side: -23". Overall Depth - Front to Back: -18". Overall Product Weight: -110 lbs. Assembly: Assembly Required: -Yes.